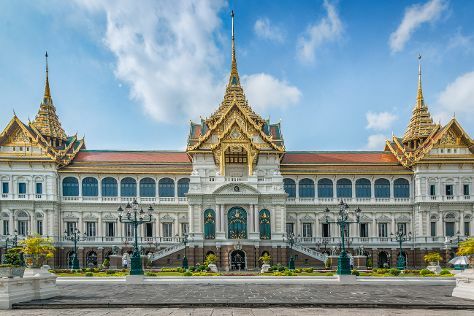 Kick off your visit on the 17th (Sun): explore the historical opulence of The Grand Palace, then delve into the distant past at Wat Pho, then take in the spiritual surroundings of Temple of Dawn (Wat Arun), and finally take in the spiritual surroundings of Wat Saket. Here are some ideas for day two: contemplate in the serene atmosphere at Temple of the Emerald Buddha (Wat Phra Kaew), then identify plant and animal life at SEA LIFE Bangkok Ocean World, then admire the landmark architecture of Jim Thompson House, and finally take in the spiritual surroundings of Temple of the Golden Buddha (Wat Traimit). For more things to do, photos, where to stay, and more tourist information, go to the Bangkok tour itinerary planner . Calgary, Canada to Bangkok is an approximately 20.5-hour flight. You can also do a combination of bus and flight. The time zone changes from Mountain Standard Time to Indochina Time, which is usually a 14 hour difference. In March, Bangkok is much hotter than Calgary - with highs of 40°C and lows of 30°C. Cap off your sightseeing on the 19th (Tue) early enough to travel to Patong. Kick off your visit on the 19th (Tue): get outside with Outdoor Activities, enjoy some friendly competition at SF Strike Bowl - Jungceylon, then view the masterpieces at Apichart art gallery, then make a trip to Big Buddha Phuket, and finally view the masterpieces at The Phuket Gallery. Keep things going the next day: browse the different shops at Ocean Plaza Patong, then don't miss a visit to Bangla Road, and then take in the exciting artwork at Patong Inn Art. To find where to stay, photos, traveler tips, and tourist information, read our Patong route planner. Getting from Bangkok to Patong by combination of flight and bus takes about 5 hours. Other options: drive; or do a combination of train and bus. Traveling from Bangkok in March, you can expect nighttime temperatures to be little chillier in Patong, with lows of 27°C. Wrap up your sightseeing by early afternoon on the 20th (Wed) to allow enough time to travel to Ko Phi Phi Don. Get outdoors at Scuba & Snorkeling and Ko Phi Phi Le. There's much more to do: see the vivid underwater world at Ko Bida Nok, explore the fascinating underground world of Viking Cave, enjoy the sand and surf at Long Beach, and tour the pleasant surroundings at Nui Beach. To find more things to do, traveler tips, and more tourist information, go to the Ko Phi Phi Don trip planning site . Do a combination of taxi and ferry from Patong to Ko Phi Phi Don in 1.5 hours. 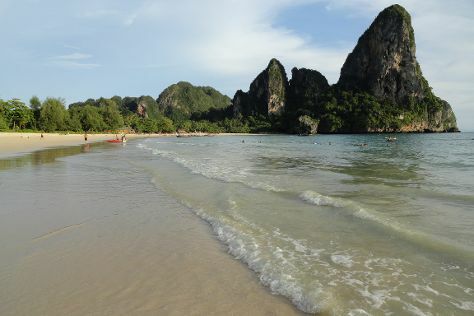 In March, daily temperatures in Ko Phi Phi Don can reach 41°C, while at night they dip to 26°C. Finish your sightseeing early on the 23rd (Sat) to allow enough time to ride a ferry to Ko Lanta. Get outdoors at Scuba & Snorkeling and Kantiang Bay. Your cultural itinerary includes sights like Lanta Art and Lanta Old Town. There's much more to do: identify plant and animal life at Lanta Animal Welfare, stop by Fashion Point, enjoy the sand and surf at Long Beach, and stroll through Khlong Dao Beach. To see ratings, maps, reviews, and tourist information, read our Ko Lanta trip itinerary maker tool . Getting from Ko Phi Phi Don to Ko Lanta by ferry takes about an hour. March in Ko Lanta sees daily highs of 41°C and lows of 26°C at night. Finish your sightseeing early on the 26th (Tue) to allow enough time to ride a ferry to Railay Beach. A quiet and picturesque peninsula, Railay Beach sits between Krabi and Ao Nang. Start off your visit on the 27th (Wed): hike along Tab Kak Hang Nak Hill Nature Trail, take in the spiritual surroundings of St Agnes Catholic Church, and then enjoy the sand and surf at Railay Beach. On the next day, explore the activities along Lagoon, get great views at Railay View Point, and then shake up your sightseeing with a climbing tour. To find other places to visit, maps, where to stay, and tourist information, read Railay Beach trip itinerary planning tool . You can ride a ferry from Ko Lanta to Railay Beach in 4.5 hours. Expect a daytime high around 41°C in March, and nighttime lows around 26°C. Finish up your sightseeing early on the 28th (Thu) so you can travel back home. For traveler tips, reviews, other places to visit, and more tourist information, go to the Bangkok online trip itinerary maker . You can do a combination of bus and flight from Railay Beach to Bangkok in 5 hours. Alternatively, you can do a combination of ferry and flight; or drive. Plan for somewhat warmer nights when traveling from Railay Beach in March since evenings lows in Bangkok dip to 30°C. On the 29th (Fri), you'll have the morning to explore before heading back home.